After the trouble Frankie caused for me during the last couple of cat outings, I decided it was time to put him back on a harness. The harness he had was just too hard to put on a struggling cat so I looked for a harness that was very easy to put on. I found one from a company called Bark Appeal. 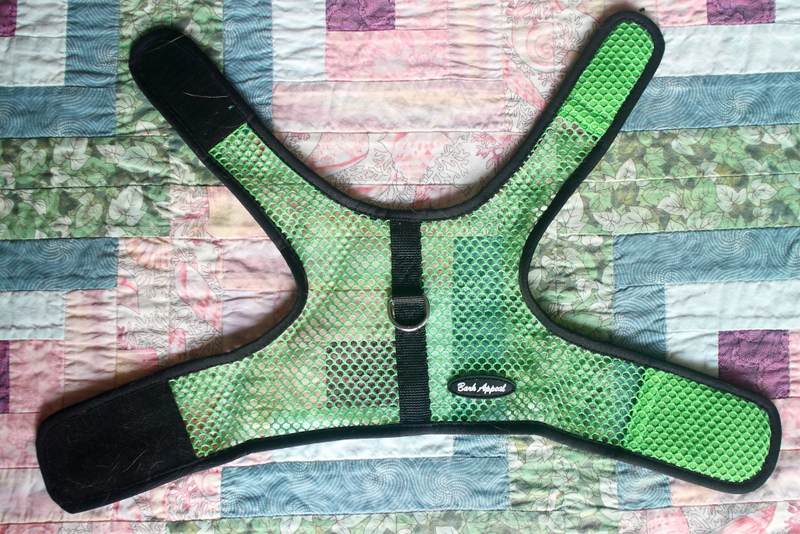 Judging by the name, I assume it is a dog harness but it also works for cats. This harness has two Velcro strips and putting it on is just a matter of wrapping it around his neck and abdomen. Frankie seemed perfectly fine wearing it. He made no attempt to get out of it and gave no indication that it might be uncomfortable. I bought the mesh version because I thought it would be cooler and lighter but there were other fabric choices. I also got a size large and it seemed a little loose on him but if he wasn’t so excited about going outside I am sure I could have wrapped it a little tighter. Rose did not want to partake in our little adventure so I had to leave Puck inside because watching two cats is hard enough if one cat is Frankie and the other Chris. I felt bad but Puck cares less about going outside that the other two boys. The outing was fairly short-lived because Chris disappeared on me and I had to bring Frankie inside so I could look for him. As soon as I got inside I saw him from the window peeking around the corner where I just was with Frankie. What do you think? Anyone else have a harness that is easy to put on? This entry was posted in Uncategorized and tagged Bark Appeal, Cats, easy, harness, Velcro on May 10, 2015 by Charles Huss. I purchased a couple harnesses in the clearance bin at Petco and they are not easy to put on. Happy Mother’s Day to Rose. I forgot to say thank’s for the Happy Mother’s Day. I hope yours was nice. I don’t think you can get into too much trouble with your mom right there. That harness looks way easier than the one I had is is probably more secure than the new one but I didn’t want to make Frankie do anything that would cause him to resist. I like the color too, parttly because it is easy to see but that really doesn’t matter unless he got off the leash somehow. When we move I think I will have to put it on Chris because the neighbors might not like an unleashed pet. What great looking harnesses. We have 2 but for us, collars have been the best solution. Mes hates having the harness around my tummy and will shred anyone with a harness in their hand!!! Glad to see that Chris is still being a wonderful Cat from Hell!